Rub elbows, swap business cards and join the over 450 young Jewish professionals who have discovered that the best networking in Detroit is at NEXTWork. 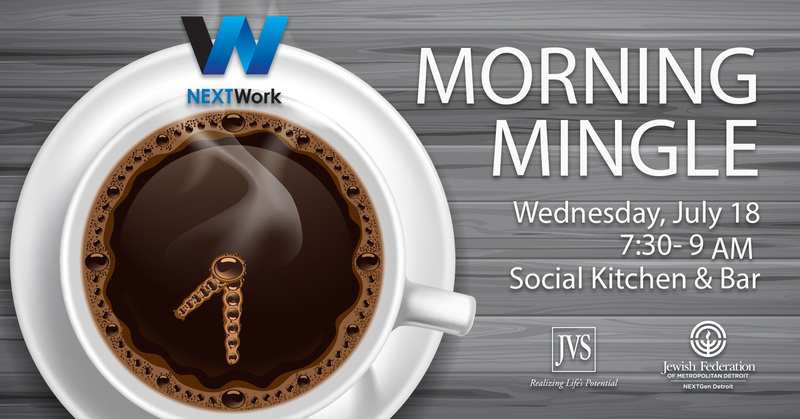 BONUS: Hear Jon Dwoskin, Business Coach, Author and Speaker, share advice, tips and tricks for the workplace! Parking available at 333 N. Old Woodward Ave. or on side streets. Ticket includes avocado toast, falafel lettuce wraps, coffee, bottomless mimosas, bellinis, bloody marys and screwdrivers. Questions? Contact Rachel Devries at rdevries@jvsdet.org or 248.233.4274. NEXTWork is brought to you by JVS Detroit and NEXTGen Detroit. Special thanks Hadas and Dennis Bernard NEXTWork Endowment Fund.